Treehorn is the hero of an easy-to-read, sad children’s book, “The Shrinking of Treehorn” by Florence Heidi Parry. She cleverly exposes adults’ couldn’t-care-less attitude towards the needs of children, even when the circumstances of mal-treatment of children are patently obvious. Treehorn found that parents, teachers and principals only pretend to care. His principal ignored his problem but was still able to say, “You were right to come to me. That’s what I’m here for. To guide. Not to punish, but to guide. To guide all members of my team. To solve their problems.” And Treehorn kept shrinking. When he started to turn green, his mother told him to comb his hair before the Smedleys arrived for bridge. Another mixture of items this week – the usual anti-GERM articles, as well as other articles focussing on a more positive approach to quality, child centred education. Bill Ferriter is another US blogger who is well worth following. The title speaks for itself. This 20 minute video is well worth watching. Articles by Alfie Kohn are always worth reading. More research to be ignored by the school ‘deform’ movement. Thanks to Australian reader Tess Pajaron, from Open Colleges, for this link. I’ve wrestled with this over the years- what role does handwriting play in an increasingly technological world? This article makes the case for teaching of handwriting. Here’s an antidote to the Bill Gates’ model – Brazilian business entrepreneur Ricardo Semler has developed this schooling model. Another pattern in the GERM movement, across the world, is the hypocrisy of the authorities over the use of ‘achievement data’. While schools are expected to ‘play the game’ and follow the requirements to the letter, the authorities play by different rules. I’ve read many overseas articles on this topic, and now evidence is starting to appear in New Zealand that indicates a similar process is happening here. We’re not yet quite sure what the intent of this fudging of information is, and investigations are continuing. In the meantime Kelvin Smythe has covered this in a number of articles. I’d add politicians, economists and corporates to the list.. Via Canadian blogger Joe Bower. Les Treichel, Retired Queensland Regional Director of Education, has sent me this document that he prepared a couple of years back. This is well worth reading, by principals and others in leadership roles, and also by all who are interested in real education as opposed to GERM infected education. This blog by Bruce Hammonds should be read and reread and reread…. History repeats, it seems, and still doesn’t work. Goes with all the other learning myths, like national standards, raising achievement, national testing, performance pay, charter schools, and so on….. My personal favourite myth is ‘brain based learning.’ Thanks to Michael Fawcett @teachernz for this link. Written for the USA; however this is very transferable to education in all GERM infected countries. It’s a longish article but well worth reading in its entirety. Will provide great ammunition to support you in debates with deformers and to inform parents etc. Michael Gove’s national curriculum reforms: where’s the creativity? “It earned some votes last time it was tried.” said Kevin. 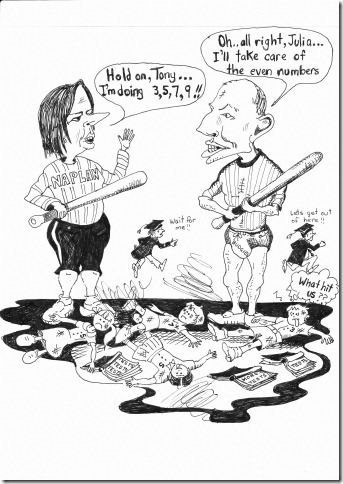 While principal and union testucators confer…. Treehorn is the hero of an easy-to-read, sad children’s book, “The Shrinking of Treehorn” by Florence Heidi Parry. She cleverly exposes adults’ couldn’t-care-less attitude towards the needs of children, even when the circumstances of mal-treatment of children are patently obvious. Treehorn found that parents, teachers and principals only pretend to care. They prefer to ignore a problem than to face it.. His principal ignored Treehorn’s problem but was still able to say, “You were right to come to me. That’s what I’m here for. To guide. Not to punish, but to guide. To guide all members of my team. To solve their problems.” And Treehorn kept shrinking. The question could have applied to the federal government’s treatment of schools, but Ms G. replied as if it applied to behaviour in the house and she said that the question might be put to Tony Abbott. In any case…. Following the cabinet meeting, cabinet members held some Q&A meetings with interested constituents. Mr. Garrett, Federal Minister for Education was questioned by Mr. Paul Thomson,Principal of Kimberley College, an independent school at Carbrook to the south-east of Brisbane. “Mr Garrett, my concern is that spending additional money on education is like putting mag wheels on a horse-drawn cart – the axle being NAPLAN and the wheels being the National Curriculum. 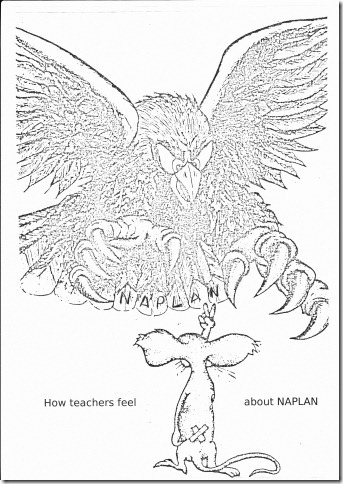 “If NAPLAN is a sustainable strategy, why is it necessary for education departments to bully teachers and principals into silence? My community is well informed and opposes extremist right wing Republicanism and I am proud of the fact that only 14 of y 139 students sat for NAPLAN tests in Year 9. I would like to add a point or two about bullying. I have been investigated 28 times since 1992 when I first opposed right-wing extremism; 14 times in the public system and 14 times as a private school principal. Will my statements today result in investigation number 29? I might add that the principal’s ACARA handbook forbids principals to ‘influence’ parents to withdraw children from the tests. I deeply resent this restriction on my freedom of speech. The only question/statement Mr. Garrett responded to was my assertion about Right Wing Republicanism. His response was : “None”. I learned that the federal Labor candidate has enrolled his children at Kimberley College – he is a decent person. Mr. Garrett laughed off publically that I would be punished for disobeying the ACARA injunction. No one asked anything other than Dorothy Dixers. They’re using the line that results are slipping therefore we should have NAPLAN. Mr. Garrett used words such as community, snapshot, aspirations, communication, snapshot, socio-economic and snapshot. Weasel words. Bruce Jones, former primary principal at Atherton, Coolum, Yungaburra etc. also reports on his audience with Mr. Paul Garrett on the same day. “I made two points : 1. Why New York and not Finland? ; 2. Why encourage teachers and children to cheat? One must conclude that, contrary to what is stated, the actual purpose of such high-stakes testing schemes is political and not at all to inform the classroom teacher or help kids to learn more or better or to improve education. We ALREADY know what works for kids [e.g. multi-age groupings] but there isn’t the will to devote the necessary resources to make it happen. As the conservative and private sector continue to privatize, monetize and squeeze the life out of public education. I’m afraid I’m not feeling very optimistic about the future. 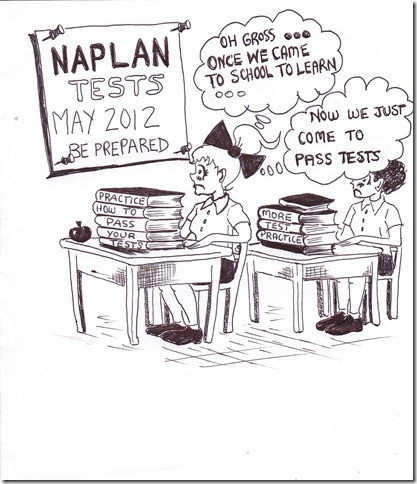 A New NAPLAN report has been released. ‘Student Summary by Class/Cohort – Future Students’ provides a cohort view of NAPLAN results for ‘future’ students for any NAPLAN years. It returns sortable data including Band, Scale Scores, and Test School – across Reading, Writing, Spelling, Group and Punctuation and Numeracy. (Extracted verbatim from a Q’ld Regional Director’s notice to schools) PLEASE EXPLAIN !!!! ???? Any official interest in music, art, health, history, geography, social interaction, learnacy? Educators [vis-a-vis testucators] around the GERM world hold hands on behalf of school children, trying to have their country’s children released from the deleterious effects of the vicious. fear-based, scatological testing programs. Testucators don’t care much about child welfare and are unable to trust….that’s why they test. Everyone, however, is encouraged to check these links as often as possible. The content of each changes from time to time. Treehorn is the hero of a masterful children’s book The Shrinking of Treehorn by Florence Heidi Parry that cleverly illustrates adult concerns for the welfare of school children. The little fellow kept shrinking and became so small that he could walk upright under his bed. Nobody – nobody – his parents, his teacher, his principal took any real interest in his well-being.except for an occasional nod. The message is a clear and simple one for all parents of school children, for less-than-ethical teachers and principals who just don’t care enough. If you only read one article from this list, make sure it is ‘The Parenting Trap.’ However that doesn’t cancel out the other articles in this list. Skim reading is a very useful skill and I confess that most of my reading consists of skimming through articles to extract the information that is useful for me. Mind you, there are some authors that are always worth reading carefully, such as the article by Marion Brady. What if testing is STOPPING our kids from learning? Thanks to Ken Woolford, Queensland, for this article. It is indeed a gem! Eleanor Roosevelt, writing in 1930. How times have changed, and not for the better. US educator Will Richardson has some useful observations here. 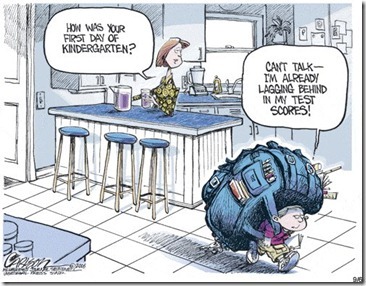 Time for everyone to rethink their assessment practices (separate from mandated assessments). How much time do kids waste on meaningless assessments? 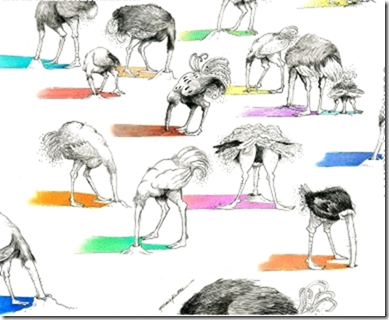 In a “rapid, verbal, energetic, improvised verbal outpouring” [aka “riff”]…..Seth Godin riffs on marketing, respect and the ways that ideas spread….. 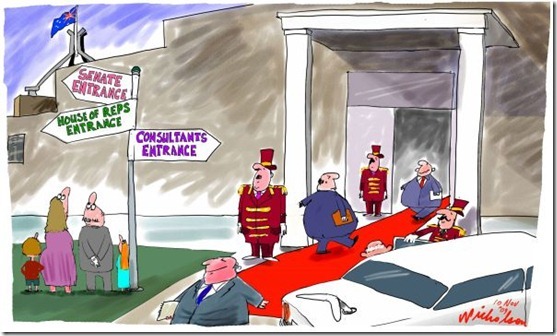 Avoiding the false proxy trap. Sometimes, we can’t measure what we need to measure, so we invent a proxy, something that’s much easier to measure and stands in as an approximation. TV advertisers, for example, could never tell which viewers would be impacted by an ad, so instead, they measured how many people saw it. Or a model might not be able to measure beauty, but a bathroom scale is a handy stand in. A business person might choose cash in the bank as a measure of his success, and a book publisher, unable to easily figure out if the right people are engaging with the book, might rely instead on a rank on a single bookseller list. One last example: the non-profit organisation that uses money raised as a proxy for difference made. A.A.Gill, a father of four argues that the biggest problem that kids face is the byzantine education-industrial complex known as school, which ruins the most carefree and memorable years of their lives. He says that you are not allowed to put his article on the fridge door nor put it in a file marked “Kids’ Stuff”. Have a smile or big laugh at the way he gets his message across. His overall contention is:- We don’t necessarily need extra funds in the education budget; we just need those funds to be spent more wisely. David then goes on to suggest that : NAPLAN is not an investment in education…..The evidence is strong. Removing NAPLAN in its current form will do more to maximise our investment in education than any other single factor. The tests themselves are invalid and unreliable. The tests are not diagnostic. There is a strong link between poverty and home backgrounds, and educational outcomes. It is disingenuous of the government to argue that NAPLAN results can lead to schools getting more money. NAPLAN is placing an unhealthy emphasis on literacy and numeracy at the expense of important curriculum areas such as science, social education and the arts. The design of the tests advantages shallow thinkers. His piece de resistance [I thought]…. they measure isolated, low-level performance – but society requires effective cooperation, assimilation of other people’s ideas into our own, and group performance. Teachers “teach to the test” because the NAPLAN results are used inappropriately, turning the tests into high-stakes tests. Finally : We have imported a failed model from the USA. Research demonstrates that large-scale assessments will not raise literacy standards. MEET AUSTRALIA’S IDOL Our schooling system, the ‘failed model’ indicated by David, is based solely on the schooling views of this man. His name is Joel Klein, former lawyer and he has been in control of the Murdoch empire’s school-test production and publishing, as well as online delivery of tests and curriculum, since 1 January, 2010. His starting salary was $4million per year. [Rupert Murdoch has estimated this part of his business empire to be worth $500billion in the U.S.A. alone.] Blanket testing of school systems is big, big business. That’s the purpose of Australia’s commitment to its version of GERM:- to help mega-publishing firms in New York to make money. There is no obvious ‘other’. Klein also provided ‘oversight and guidance’ for the Murdoch family during the News of the World investigations in England; and was responsible for the purchase of Wireless Generation, a technology company that developed and managed New York’s school data warehouse. He is good at his job. He is a sweet-talker and publically claims the Australian system as his. He ‘owns’ it. We can’t deny it. We seem to be proud of it. We keep it rolling. All Australian authorities and control agents encourage his philosophy: fear is the best way to force learning progress, threats and shame will maintain it as will repression of professional ethics. It is so obvious. 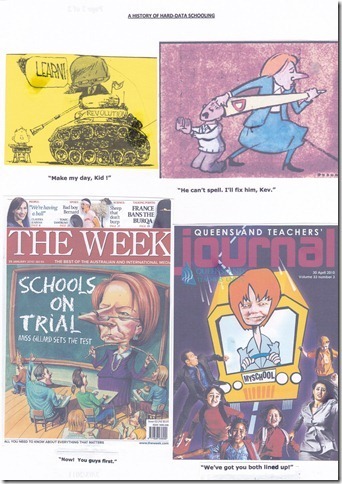 Led by Rudd and Gillard with opposition support, it took over all democratic modes of schooling quite easily; and Australia raced to the fore with its present dictatorial form of political control of schooling. The Klein design. Heil. Rudd and his Education Minister, Gillard had proposed a tough “education revolution” back about 2007. Gillard listened to a glowing description of one at a cocktail party in New York and bought it immediately. It was a doolally moment for her. At or following the ‘knees-up’, she arranged for Joel Klein to visit Australia and spread his gospel amongst bankers and business executives The Federal Opposition was jealous at the time. It claimed that the fear-motivator model was a copy of one that they had “put forward in 2004 but didn’t carry through”. 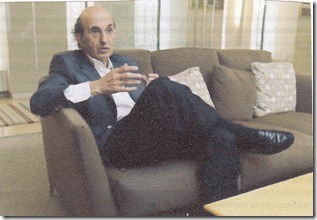 While he was here [August- September 2008] Joel Klein mentioned during an ABC interview with Monica Attard [ http://www.abc.net.au/local/stories/2008/08/28/2348955.htm ] that his discussions with J. Gillard were around the use of hard data for assessment and he had explained how his modus operandi improved test scores. “He infected Julia Gillard with his enthusiasm when the two met.” says Monica Attard. That’s our hero; the philosophical leader, guide and mentor of Australian testucators and naplanners. His photograph, here supplied, should hang in an honoured place in every principal’s office where NAPLAN tests are conducted. ADVOCACY FOR CHILDREN Although principals’ groups, teacher unions and well-intentioned associations were press-ganged into service on behalf of the Klein clan and remain stuck there, there are many experienced and thoughtful educators in all GERM countries who are prepared to stand up for children’s rights. 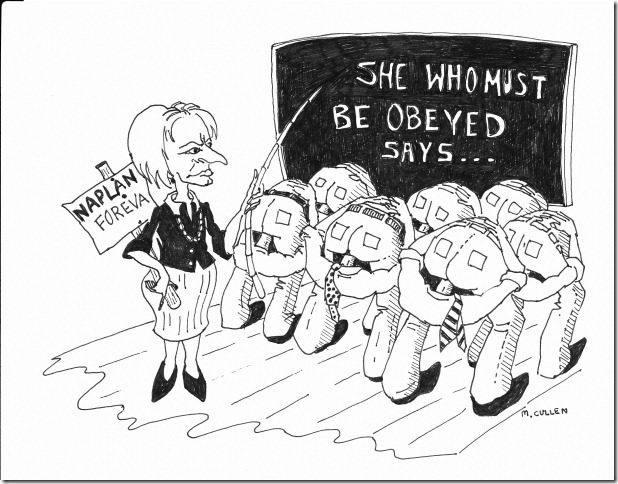 That’s what anti-NAPLANNERS in Australia; what anti-Nationals Standards in New Zealand; anti-NCLB in the USA; anti-‘Standards’ in England are about : CHILDREN. This is clearly demonstrated in Stephan Breen’s summary of the ‘Features of GERM’ on behalf of West Australian Primary Principals. As an expression of this fair-dinkum love for kids, more and more parents are withdrawing their children from the despicable, unproductive contest; many parents and teachers are proud to display “Say NO to NAPLAN” stickers on their cars; some principals have exerted their professional ethics and told their parents about the effects of NAPLAN on learning at their meetings and through newsletters; more and more are including the ‘right to withdraw’ clause on enrolment forms. There seems to be an optimistic growth in respect for school children and their learning conditions. What a whopper statement from WAPPA ! Howard Gardner [Renowned Professor.- Harvard] “ In many ways, the education that has been promoted is regressive, It presumes a population that was needed in the 19th or 20th century.We want and need for the 21st– versatile, critical and creative problem solvers, and responsible, decent, well-informed citizens. The curriculum has been narrowed to STEM [science, technology, engineering, math] subjects and the assessments to multiple choice, fact-centred instruments. Every educator and every parent in America should read Pasi Sahlberg’s book, Finnish Lessons. Finland has catapulted from a country with a mediocre educational educational system to perhaps the most admired system in the world. It has done so by ignoring the GERM approach to educational reform favoured by the U.S. and England. Donald Clark [Sussex] : Like the leaning tower of PISA, the OECD PISA results are built on flimsy foundations and are seriously skewed….The problems in the data are extreme, as PISA compares apples and oranges. In fact it compares huge watermelons with tiny seeds. A YOUNG PERSON’S VIEW OF SCHOOLING :- In a recent Year 10 art project at Alfred Deakin High School, Canberra, Liam Cullen [yes] presented a young person’s view of the current, education system. His graphic (click on it to see full image) covers all that can be said about Australian schooling as it is now; every thing from NAPLAN to HSCs, the hindersome hallmarks of our education system. Our warmest and sincerest best wishes, by the way, go to those who contest November’s end-of-school ‘farewell exams’ after 12 years of formal schooling. British-based, traditional systems such as ours, hold paper-and-pencil type tests that have been designed to sort Year 12 pupils out, to make things easier for tertiary level educators, business executives and job interviewers. As Liam illustrates, the ‘graduates’ will, after the examinations, get a tick or a cross for their 12 years of schooling. They will find out, as they exit their school, whether they will follow their chosen path or if their hopes have been spoiled. Let’s pray that the system has produced students of something or other…..self-motivated students of learning in particular. They are, no longer, school pupils. They are, generally speaking, on their own; and their future relies on how much they have learned about how to learn more about favoured life topics. Let’s hope that each individual’s identity has not been suffocated too much by our one-size-fits-all testing mania.